M-Bike, a bike sharing program, launched at the Meridian International Business Center in Douglas County. Bill Pauls once casually mentioned to me that soon after he bought the sprawling Meridian International Business Center in Douglas Count, he wondered if he had made a mistake. Pauls, now head of the Pauls Corp., bought Meridian just in time to watch the local economy crash with falling energy prices, putting on hold the demand for suburban offices in a campus setting. The former Peninsular & Oriental Steam Navigation, based in London, sold the tech center and Meridian to Shea Properties for an estimated $150 million in 2006. “All our guys are doing is riding their bikes all day” on the new roads in Meridian, as they waited for the master-planned business center to take shape, I recall Pauls telling me. This map shows where all of the bike stations will be in the Meridian International Business Center. Meridian has come full circle from the days when bike riding was a symptom of a dormant development. Today, the Meridian Metro District is unveiling the installation of M-Bike, an 11-station bike sharing system. 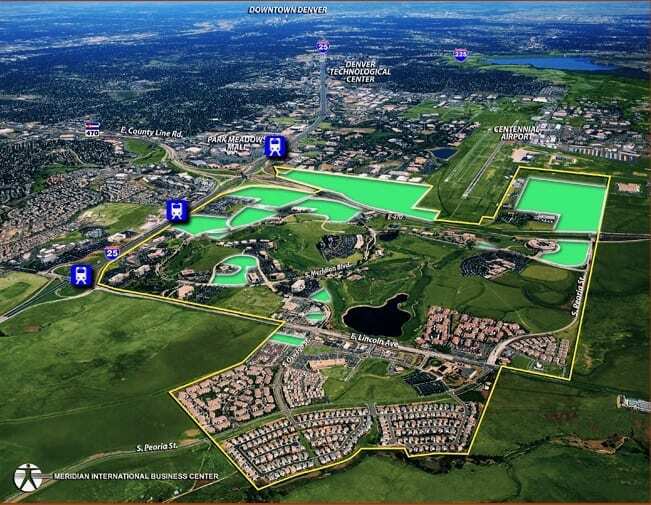 M-Bike is dedicated to those who live and work within the 1,685-acre Meridian International Business Center, at the crossroads of Interstate 25 and E-470. The Centennial Trail runs along the district’s northern boundary and provides access to an 11-mile network of bike paths in Meridian. “We believe we are pioneers” in providing a bike system in a master-planned business park, said Eric Hecox, general manager for the district. When doing his due diligence on whether a bike sharing system was feasible, he could only find one other master-planned park in the nation that provided the service. “Some big companies, like Google and Facebook, provide bike-sharing systems on their office campuses, but the only other master-planned business park we could find that offered bike sharing was outside of Dallas,” he said. The M-Bike system opens today not only with 11 bike stations but also with 100 places to dock bikes and 50 bicycles. The Meridian Metro District, which is funding the $90,000 first phase of the system, plans to double its size next spring. The system is built and installed by Zagster Inc.
Meridian is a bustling business park that includes 27 office buildings, six apartment communities, 25 retail buildings and 40 retailers. “Shared bikes will enhance the campus atmosphere of the Meridian complex and help tie the community together,” according to Hecox. “M-Bike will reduce the number of short trips in cars and provide an environmentally friendly way to get around Meridian,” he added. The district board began looking at bringing a bike-sharing program to Meridian last fall. “It was part of our overall effort to continually improve our services and infrastructure. 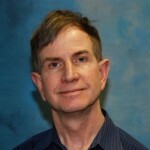 A lot of ideas get batted around, and some get traction and some do not,” Hecox said. Several members of the Meridian District board are avid bikers. “Certainly, our board’s chairman, Peter Culshaw, was quite a proponent of the idea and loves to ride his bike,” Hecox said. It also is paramount to Culshaw to keep Meridian as cutting-edge as possible, he said. “I think it will be absolutely amazing. We anticipate people will use M-Bike for commuting, picking up a sandwich or cup of coffee, or a recreational spin for fresh air and exercise,” said Culshaw, who is not only chairman of the Meridian District board but also an executive vice president for Shea Properties. 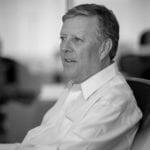 Peter Culshaw, chairman of the Meridian Metro District and an executive vice president at Shea Properties, is a big supporter of the new bike-sharing program in the Meridian International Business Center. The bike sharing program, if as successful as to be expected, also could be brought to the Denver Tech Center, which also is owned by Shea Properties. “I’m also the general manager of the Goldsmith Metro District” in the tech center, Hecox said, so he has an inside track in expanding the operation to the DTC. Running a metro district is like running a city. The new M-Bike system can help address one of the most vexing problems of a transit-oriented developments such as Meridian, the so-called “last mile” conundrum. That is, even if an office park is served by a light-rail station, as Meridian is, if your office is not right on the station, it probably is not practical to walk to where you work after you get off the train. “We’re putting the largest bike station at the Lincoln RTD light-rail station,” Hecox said, to address exactly that issue. Shown is a Zagster Bike that will be used in Meridian. The bikes are supposed to be 30 percent lighter than bikes in some other bike-sharing programs. “We think more people will take light rail if they can conveniently hop on a bike and ride to their office, which might be too far away to conveniently walk to,” he said. Along the same lines, they are putting in bike stations at several apartment buildings in Meridian. A number of big tenants, such as CH2M and Toastmaster, have partnered with Meridian, which allows their employees to use the bikes at no cost. “I think as more companies learn about this and word of mouth gets around, more companies will want to participate,” Hecox said. “Ultimately, we expect a large percentage of the companies here will team up with us,” he said. 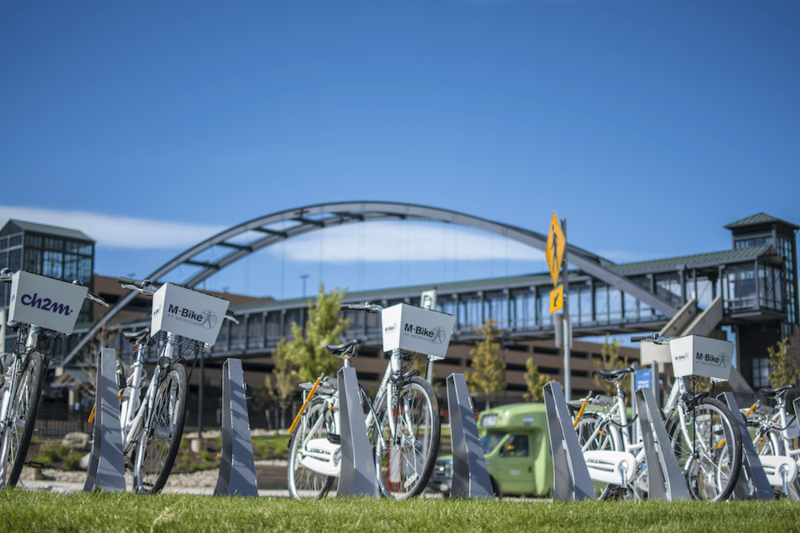 The Meridian International Business Center in Douglas County is now home to an innovative bike-sharing system. “We think it is going to succeed, but just in case it did not, we didn’t want to own 50 or 100 bikes,” Hecox said. 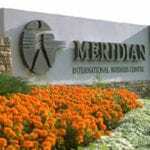 The 1,685-acre Meridian International Business Center has long been a mecca for avid bike riders. 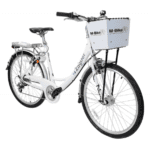 Now, Meridian has announced an innovative bike-sharing program. And while the bikes don’t have GPS, they will be able to track where they are picked up and dropped off, providing valuable data on the most popular routes and giving them a good estimate on how many miles of driving are being eliminated and the environmental impact of the system. “This data will give us a really good handle on things like traffic reduction,” Hecox said. 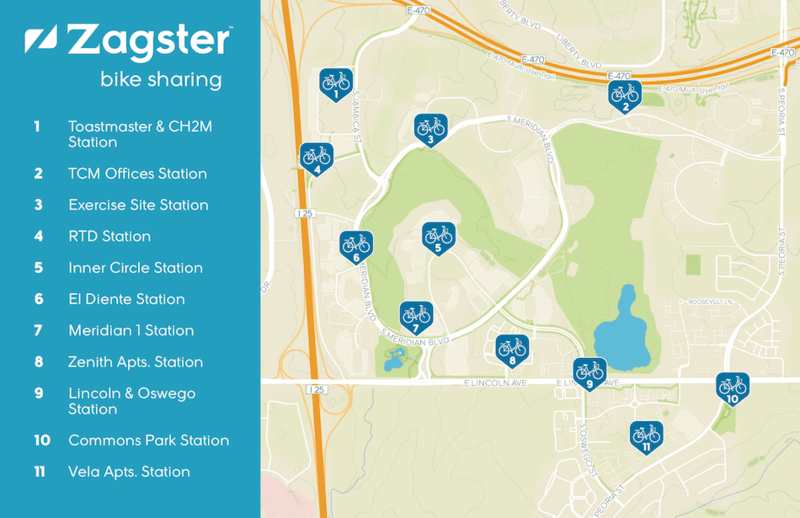 He also liked that Zagster still uses individual stations, although that could be changing. “Some industry people think the next innovation will be that you can drop off the bike anyplace you like, like you do with Car2Go,” Hecox said. I told Hecox about the brief conversation I had with Bill Pauls, regarding the early days of the Meridian International Business Center, when his staff spent their days riding their bikes around the business park.